Stocksville is an unincorporated community in Buncombe County, North Carolina. Located at the intersection of Old Mars Hill Highway (SR 2207) and Murphy Hill Road (SR 2134), near the Future I-26/US 19/US 23 interchange (exit 17). North Buncombe High School is located nearby. 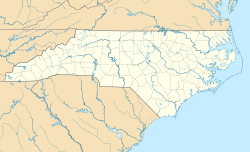 ^ a b "Stocksville, North Carolina". Geographic Names Information System. United States Geological Survey. Retrieved October 29, 2014. This page was last edited on 15 March 2019, at 18:51 (UTC).